Bak Kwa is a popular snack and gift during the Chinese New Year. 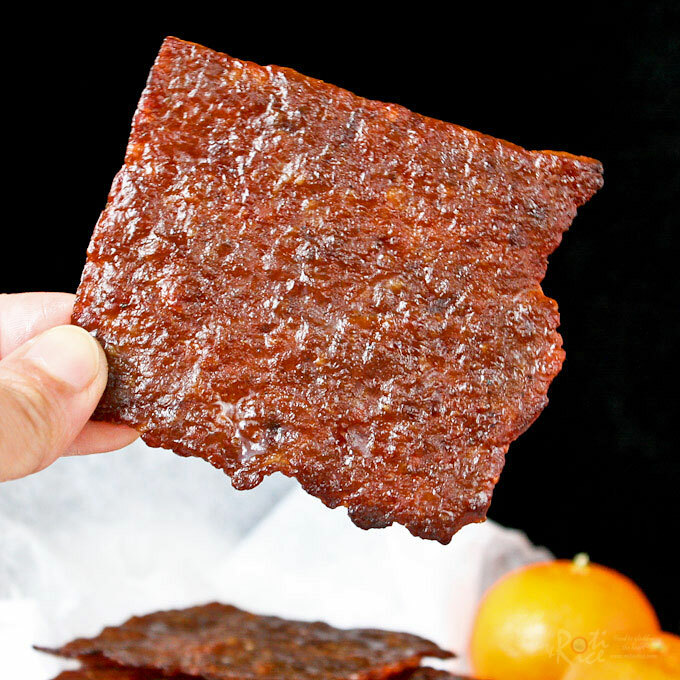 These barbecued wafer thin pieces of sweet and salty pork jerky are simply irresistible. Prepare 3 sheets of parchment paper the size of a jelly roll pan (15.5in x 10.5in). Spread a thin layer of meat mixture with a butter knife onto parchment paper. The meat layer should be about 2mm to 2.5mm thick. Leave an inch around the perimeter of paper clear of meat for easy handling. Place a large piece of shrink wrap over the meat. Using a rolling pin, roll over meat to smoothen and even out the spread meat. Remove shrink wrap. Repeat with the other two sheets of parchment paper. The third sheet will be about half filled. Transfer to jelly roll pan and bake in a 250°F (120°C) oven for 15 minutes. The partially cooked meat should be nice and dry**. When it is cool enough to handle, cut pre-cooked meat into 6 slices. Increase oven temperature to 425°F (220°C). Transfer meat and parchment paper to a broiler pan this time and grill for approximately 5 minutes. Meat burns easily at this stage. Adjust time accordingly. Remove from oven. Flip slices of meat over with a pair of thongs. Return pan to oven for another 5 minutes. Remove and cool completely on a wire rack.